Gobble it all? Or in moderation, for progress's sake? "Gabbuchi", an action puzzle brain exercise game with simple controls. 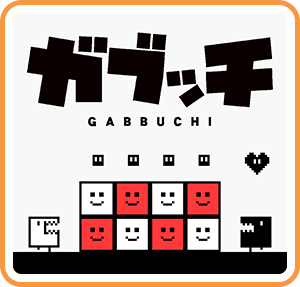 "Gabbuchi" is a curious creature that loves gobbling blocks and stuff. His favorite food is the heart cookie. In order to get it, you have to think about which blocks he can and can't gobble. He can gobble blocks the same color as himself. You can change his color, too, so he can gobble different colored blocks. Blocks that are a different color from Gabbuchi can also serve as supports to reach high places! The more Gabbuchi eats, the more satisfied he gets. But, if you make him eat too much he won't be able to get to his heart cookie, so you have to think carefully about what blocks he should and shouldn't eat! There are 180 stages awaiting Gabbuchi, ranging from easy to hard. With the included level editor, you can even make your own stages, so there's no end to all the ways you can satisfy Gabbuchi! Where can I buy Gabbuchi physical/digital?